outdoors, or anyone who enjoys freedom from their glasses. Get relief from those glasses that fog up on cold days. The optometrists at North Peace Optometry Clinic can offer contact lenses to suit your lifestyle. We implement the latest technology in contact lens material and diagnostic equipment to provide contact lenses with the best comfort and vision. Your eye health is important to us, so we take care to perform a thorough health examination of your eyes and fit you with contact lenses that fit the unique shape of your eyes. Our expert staff will train you on proper contact lens hygiene and care, after which you will get the opportunity to take them for a trial. As added value, when you purchase your contact lenses from North Peace Optometry Clinic, you are reassured that you will be getting the best product and service. We will examine your contact lenses free of charge at each eye exam. 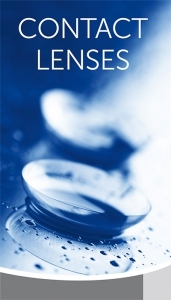 We offer free replacement of your lenses if your prescription should change or if you ever have a defective lens. We will always keep you informed of the newest products and offer free trials if you ever wish to try another product. Offer the best comfort and will almost never fall out. These contact lenses are disposable and simple to care for. Soft contact lenses can correct for astigmatism and are available in multifocals, which allow for better near vision without reading glasses. Rub and rinse your contact lenses with contact lens disinfecting solution—never water or saliva— to clean them each time you remove them. Replace your contact lenses as recommended by your eye doctor. Acuvue Oasys with Transitions. The first-of-its-kind light-adaptive contact lens. Seamlessly adapts to the light around you for all-day soothing vision.